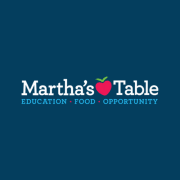 Martha's Table, Inc. Martha's Table, Inc. Since 1980, Martha’s Table has worked to support strong children, strong families, and strong communities by increasing access to quality education programs, healthy food, and family supports. We believe that every child deserves the opportunity for their brightest future and a deeply engaged family and community committed to their success. Since 1980, Martha’s Table has worked to support strong children, strong families, and strong communities by increasing access to quality education programs, healthy food, and family supports. We believe that every child deserves the opportunity for their brightest future, and a deeply engaged family and community committed to their success. Our work focuses on three areas: Food, Education, and Community Supports. Would you recommend Martha's Table, Inc.?